The relationship between the volume and pressure of a gas was studied experimentally by Robert Boyle in 1662. He used mercury and a simple U-tube.The pressure was increased by putting more mercury into the open limb. The volume of the air enclosed in the space above mercury in the shorter limb was noted each time. Temperature remaining constant, the volume of a given mass of a gas is inversely proportional to its pressure. where P and V represents the pressure and volume of the gas and k is a constant whose value depends upon the mass of the gas and the temperature. The constant value obtained for PV is called Boyle’s constant. Temperature remains constant ,the product of pressure and volume of a given mass of a gas is constant. If the pressure is doubled at constant temperature, the volume is reduced to half.Similarly if pressure is made four times, the volume is reduced to ¼ and so on. 1) P vs 1/V when a straight line passing through the origin is obtained. 2) PV vs P when a straight line parallel to X-axis is obtained. 3) P vs V when branch of hyperbola in the first quadrant is obtained. The value of constant depends upon the amount of gas taken and the temperature. Hence, for a given amount of the gas taken, a different temperature P-V curve is obtained at each temperature. Such P-V curve at constant temperature is called isotherm. At constant temperature , for a fixed mass of the gas ,density is directly proportional to pressure. At altitude ,as the atmospheric pressure is low, the air is less dense. As a result ,less oxygen is available for breathing. The person feels uneasiness and headache. This is called altitude sickness. That is why the mountaineers have to carry oxygen cylinders with them. The effect of temperature on the volume of a gas at constant pressure was first carried out by a French scientist, Jacques Charles in 1787 and then extended by Joseph Gay Lussac in 1802. Pressure remaining constant ,the volume of a given mass of a gas increases or decrease by for every 1/273 of its volume for each degree rise or fall in temperature. where V is the volume of the gas at t° C and Vo is its volume at 0° C.
At gas at -273° C will have zero or no volume i.e. it will cease to exist. Graphically by plotting the volume of a certain mass of a gas against temperature at constant pressure. We get a graph consisting of a straight line. If we extrapolate this straight line, it will meet the temperature axis at -273 ° C. At -273° C ,a gas occupies zero or no volume. At constant pressure, the straight line V- t plots obtained for different amount of the same gas or for same amount of the different gases are different but each of them intersect the temperature axis at – 273° C corresponding to zero volume. Each line in the plot is called isobar because it gives a plot of V vs T at constant pressure. Higher the pressure, less, is the slope of the line. The lowest possible hypothetical or theoretical temperature of -273° C at which gas is supposed to have a zero volume is called absolute zero. Lord Kelvin has suggested a new scale of temperature starting with – 273° C as its zero. This scale of temperature is known as Kelvin scale or absolute scale. On this scale ,freezing point of water is O° C is 273 °A. Any temperature on the centigrade scale can be converted to that on the Kelvin scale by just adding to 273 to its value on the centigrade scale. where T and t° C are the temperature on the Kelvin and centigrade scale.This scale of temperature is also called Thermodynamic scale of temperature. The volume of a gas and its temperature on the Kelvin scale are directly proportional to each other. The numerical value of k depends upon the amount of the gas taken and the pressure. Pressure remaining constant ,the volume of a given mass of a gas is directly proportional to its temperature in degree Kelvin. Air expands on heating and hence its density decreases. Thus hot air is lighter than the atmospheric air. This fact is made use of in filling hot air in the balloons which rise up for metrological observations. Volume remaining constant, the pressure of a given mass of a gas increases or decreases by 1/273 of its pressure at 0 ° C for every 1 ° C rise or fall in temperature. where Pt and Po are the pressure of a certain amount of gas at t°C and 0° C.
The numerical value of the constant k depends upon the amount of gas taken and the volume. Volume remaining constant ,the pressure of a given mass of a gas is directly proportional to its temperature in degree kelvin. At constant molar volume ,the plot of pressure versus temperature will be a straight line .Such a plot is called isochore. Equal volume of all gases under the same conditions of temperature and pressure contain equal number of molecules. One mole of each gas at the same temperature and pressure should have the same value. When Standard temperature and pressure condition (STP) are taken are 0 °C and 1 atm pressure, molar volume of the gas =22400 ml. When Standard temperature and pressure condition (STP) are taken are 0 °C and 1 bar pressure, molar volume of the gas =22700 ml. When Standard temperature and pressure condition (STP) are taken are 25 °C and 1 bar pressure, molar volume of the gas =24800 ml. The density of a gas is directly proportional to its molar mass. The equation which gives the simultaneous effect of pressure and temperature on the volume of a gas is known as ideal gas equation or equation of state. Let the volume of a certain mass of a gas change from V1 to V2 when the pressure is changed from P1 to P2 and temperature from T1 to T2. Suppose that the volume of a given mass of a gas changes from V1 to v when the pressure is changed from P1 to P2 at constant T1. Suppose that the volume v changes to V2 when the temperature is changed from T1 to T2 at constant pressure P2. where R is a constant of proportionality and is found to be independent of the nature of the gas and depends only on the amount of the gas taken. R is called universal gas constant. This is ideal gas equation. Derivation of Ideal gas equation from laws. A gas which obeys ideal gas equation is called ideal gas. Under similar conditions of temperature and pressure, densities of different gases are directly proportional to their molar masses. 2) In C.G.S., units ,for 1 mol of the gas at N.T.P. 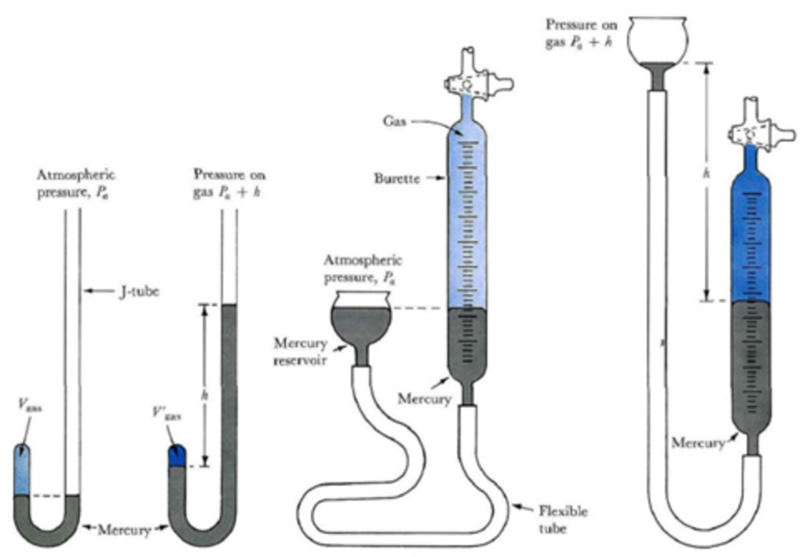 If two or more chemically non-reactive gases are enclosed in the same vessel, the pressure exerted by the mixture were first studied by John Dalton in 1807. If two or more gases which do not react chemically are enclosed in a vessel, the total pressure exerted by the gaseous mixture is equal to the sum of all the partial pressure that each gas would exert when present alone in the same vessel at the same temperature. Whenever a gas is collected over water, it is moist ,that is ,it is saturated with water vapours which exert their own pressure. The pressure due to water vapour is called aqueous tension. The spreading of the molecules of a gas throughout the available space is called diffusion. Effusion is a process in which a gas under pressure escapes out of a fine hole in a vessel. For ex: leaking out of a gas from a cylinder or air from a punctured tyre or escaping out of perfume molecules through the atomizer etc. Thomas Graham observed that the lighter gases are inversely proportional to the square root of their densities. Ratio of densities of two gases is equal to ratio of the vapour density. If two gases are taken at different pressure ,than as greater the pressure ,greater is the number of molecules hitting per unit area ,greater is the rate of diffusion. For two gases undergoing diffusion at the same pressure but at two different temperatures. Comparison of volumes of two different gases effused or diffused in the same time. Suppose v1 is the volume of gas 1 diffused in time t and v2 is the volume of a gas 2 diffused in the same time t under the same condition of temperature and pressure. Volumes of two gases effused or diffused in the same time under similar conditions of temperature and pressure are inversely proportional to the square roots of their densities. Suppose t1 is the time taken for the gas 1 for diffusion of volume v1 and t2 is the time taken for gas 2 for diffusion of the same volume v under same condition of temperature and pressure and through the same orifice. Time taken for effusion or diffusion of same volume of two different gases under the same conditions of temperature and pressure are directly proportional to the square roots of their densities. 1)It helps in the separation of gases having different densities. 2)It helps in the separation of isotopes of certain elements. 3)It helps to determine the densities or molecular masses of an unknown gas by comparing its rate of diffusion with known gas.